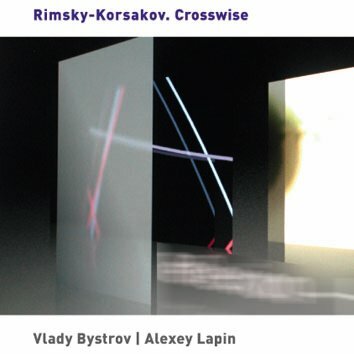 LEO RECORDS: CD LR 582: Vlady Bystrov / Alexey Lapin - Rimsky-Korsakov. Two young Turks of Leo Records, the saxophonist Vlady Bystrov of Germany and the pianist Alexey Lapin of Russia (see CD LR 524 & 540), join forces to throw a gauntlet to the Russian classical composer Rimsky-Korsakov - the duo performed under a huge portrait of the great Russian Master whose spirit was haunting the performance. Although Bystrov added to his saxophone a huge array of electronic instruments while Lapin played acoustic piano only, the musicians abandoned their egos to create an exciting blend of perfect harmony.